Having time together to share experiences, reflect, move our bodies, question, and create is critical to women's wellbeing. In our lives, these moments have shaped who we are, giving us answers and strength when we need it most. This retreat started as a tiny dream in a woman's heart and quickly caught momentum as more and more of us expressed enthusiasm at this idea: having a space of our own. Our intention is to create that space as playful - and one that rejuvenates, brings light, and offers ample time for reflection. "Form the Ocean" means so much: It's a really fun contra dance figure. It's a metaphor for coming together in a unequivocal mass of dynamic solidarity. It's an expression of the ever-shifting and varied state of our lives. It speaks to the range of capacities we have in us - from our warm and quiet pools of nurturing to our unstoppable tall waves that roar and slap. And it's a way to explain the magic that will occur during this weekend. We know we are the ones we'll reply on to shape our shared future. Let's start now. Form the Ocean. Dela Taylor Murphy (pronounced DELL-uh TAE-ler MER-fee) (she, her, hers) is a dancer, contra dance caller, and organizer who lives in Portland, Maine. 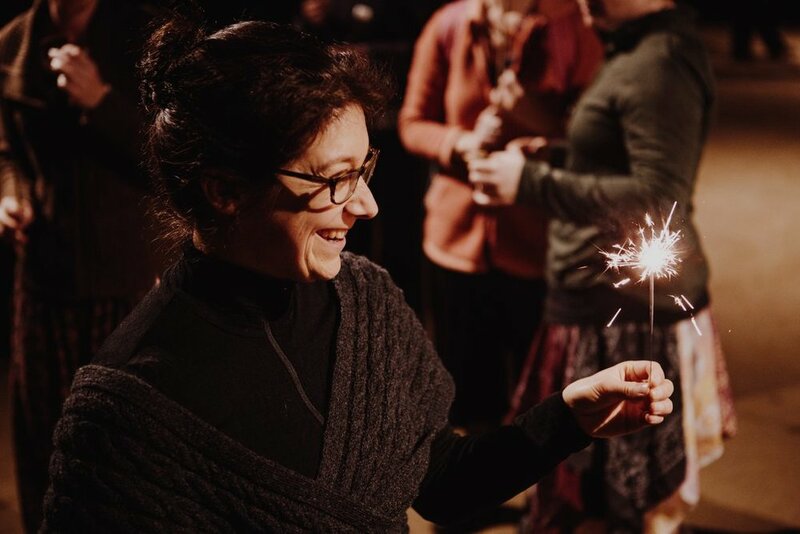 She's co-founder of Portland Intown Contra Dance, and does a whole mess of other things in her life that fall into the category of "helping things go good." Some of that good stuff is leadership development, placemaking, and cultivating the arts. Kristen Planeaux (pronounced KRISS-tin pluh-NOH) (she, her, hers) sings, dances, calls, plays, and organizes in Cincinnati, Ohio. She's a member of The Ripples, Mulberry Street, and several other loosely affiliated bands. Much of her time is devoted to teaching music to children, but she enjoys dabbling in the folk arts so much that she'd really like to become a full-time dabbler. 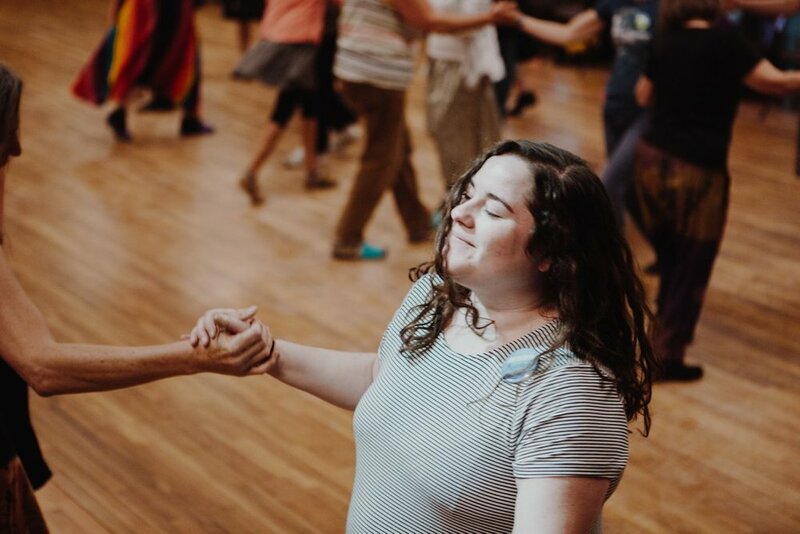 Her dream a safe and joyful contra dance space for all, and to this end she has collaborated with fellow organizers in her local community and elsewhere to improve the dance experience across the country. Gabrielle Lanza (pronounced gab-ree-EL LAHN-zuh) (she, her, hers) is a maker feeler thinker. Some of her core values are: gratitude, art, let’s look at what is, and efficiency. 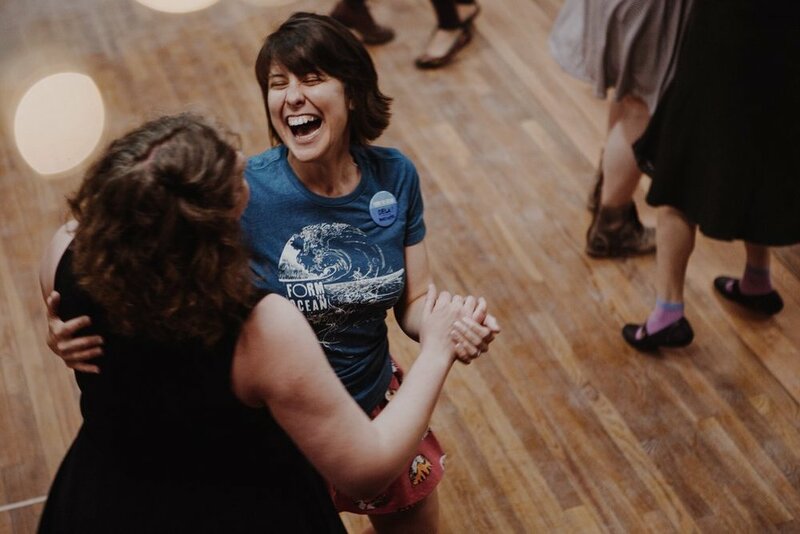 This Cincinnati native travels through the midwest and beyond to sing and drum with her beloved contra dance band, The Ripples. She has a bachelor’s degree in visual art but is equally proud of knowing how to milk cows and how to gracefully dance with chronic illness. Gabrielle is makes commissioned illustrations and designs and practices Thai Yoga Therapy. Gabrielle made those sea plant drawings and other artwork for Form the Ocean; you can check out her other stuff at Art of Gala. Avia Moore (pronounced Ah-VEE-ah more) (she, her, hers) grew up in the British Columbia folk arts scene. With a life-time of festival experience, she is known for her dedication, creativity, and enthusiasm. Avia has danced all of her life; she teaches Yiddish dance at festivals around the world and is one of organizers of Brooklyn Contra. She loves designing experiences and curating arts programming and has worked extensively as a creative producer with festivals and cultural organizationsacross North America as well as on individual artistic projects in North America and Europe. She also moonlights as a photographer and graphic designer. Avia is a PhD student in the Theatre and Performance Studies program at York University (Toronto). Weaving together performance theory, cultural memory, and cultural policy, her research examines the ways in which heritage and traditional cultures are performed on modern stages and in contemporary life.